However, the modern age prefers to have some new styles in account for bridal jewellery designs as well in order to give a perfect blend of modern and traditional appearance to the bride on the most important days of her life. Now-a-days brides generally opt for floral designed jewellery on mehendi and haldi, which is absolutely a beautiful choice and makes the bride look lovely and charming, but we have come across some unique new ideas for mehendi and haldijewellery as well. Doesn’t matter you’re having the marriage at Samode Palace Jaipur or any other luxurious wedding venue. Let’s head to check some of these designs, and then, we will see some trending floral jewellery designs as well. If you are looking for some new creative designs then you are at the right place! Ghungroos, the name itself gives a traditional feel! Ghungroos are always welcomes for such celebrations, and they never fail to give a ‘shaadivala feel’. They look charming and easily catch the eye-balls. If you are looking for jewellery designs that won’t let people get their minds-off with ghungroos are a wise choice. These stunning designs are a real piece of art and creativity that can cptive anyone for a really long time. Mirror in the jewellery are for all those who prefer not-so-simple and yet not too showy jewellery designs. These designs look very elegant and classic. It is a sumptuous choice which will surely give an edge to your look. Meenakari is an ancient type of Indian jewellery tradition and it is such a fascinating field that the desire to create a better piece than before has always kept the jewellery designs occupied in trying to create new designs using new materials that is better than the last one. People who love to adorn jewellery find the idea of experimenting with various metals and designs refreshing, which adds an advantage to customers. The bride to be should definitely consider Meenakarijewellery as these are rejuvenating designs that drives people. It certainly heightens the fashion quotient of the person wearing it as variety and uniqueness is one thing modern generation is always looking forward for. The beauty of this designs lies in the intensity of technical skills required which gives flawlessness to the ornaments. Concludingly, we can say that the dazzling Meenakari designs has a great influence in the bridal jewellery collection of India. As red is an evergreen color for lipsticks, so is gold for jewellery. It is a always a safe choice and will never disappoint you. If you wear golden jewellery, it will definitelygrab attention and will set you for the rest of your day. 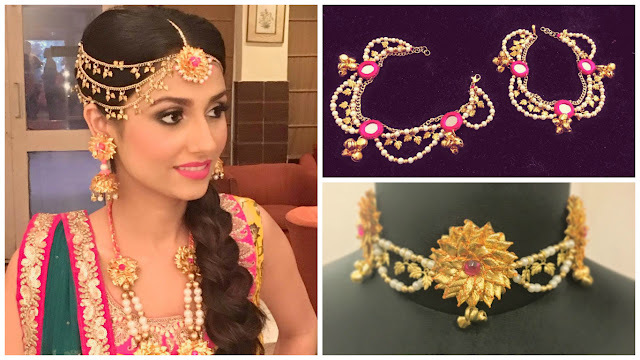 These days, it is the gota jewellery which is rapidly becoming every bride’s first choice and not those boring stones or the old floral designs for pre-wedding functions. Every bride wants to put on a different look for various events. These grand gota jewellery designs gives a new definition to royalty all over again. These designs work perfectly with all the indo-western and Indian dresses. From rings, anklets, Bengals and neck piece to sandals and crown, you can find a charming gota jewellery for everything! Certainly, white stones will never loose their allure, but these days a greater focus has been placed on other colorful stones. Colored gemstones are becoming more and more prominent and to not miss on a unique and creative new options, try considering new colored gemstones without fail. A right combination of the color of your jewellery and attire can take you to the top of fashion ladder. Times are changing now, and the modern era wants to try and experiment rather than following same old designs. Thus, consumers these days focus more on creativity and a bride should consider such new trends before landing to a final choice. Kundan Jewellery, known for it’s value and authenticity is an Indian craft that put into a fusion the brilliance of precious stones, metal and enamel in the custom Rajasthani style. It is considered to follow one of the oldest jewellery making traditions of India, and would suit a bride just beyond paradise. Time changes and so does the fashion. It is the season of the beautiful jewellery to adorn the brides. Go ahead and find the best one for yourself.